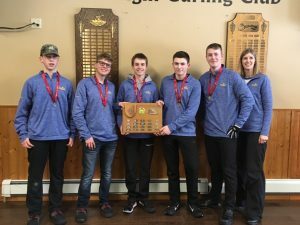 Both SDSS boys and GHSS girls are repeat BAA curling champions. On the boys side, SDSS beat SMHS 6-2 in the semi-final, and then cruised to a 10-2 win over GBCS in the final. SDSS advances with SMHS (who won the B Final 7-6 over GBCS) to the CWOSSA tournament at the Port Elgin Curling Club, hosted by SDSS on February 27-28. On the girls side, GHSS beat SHHS 6-5 in the semi-final, and then another close match with SDSS 6-5 in the final. GHSS advances with SHHS (who won the B Final 5-3 over SDSS) to the CWOSSA tournament at the Southampton and Port Elgin Curling Clubs, hosted by SDSS on February 27-28. 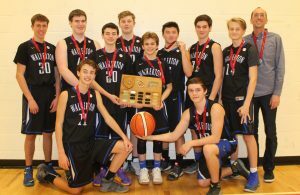 The Walkerton District Riverhawks hold 3 of 4 BAA basketball trophies, as their junior and senior boys won their respective 2018-19 basketball championships last Friday (Feb 15), hosted by OSDSS. Senior: WDCS (“A” tournament winner), GHSS (“AA” tournament winner), and OSDSS (2nd place in north division) were the three teams competing for the senior championship. WDCS finished a second consecutive undefeated BAA season with a semi-final win over OSDSS 56-42, and then a convincing final win over GHSS 63 – 24. All three teams advance to their respective CWOSSA tournaments. 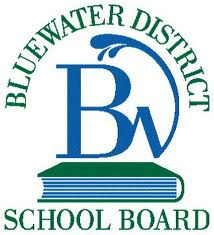 WDCS is joined by GBCS to play in the CWOSSA A tournament at Waterford District High School on February 21/22. GHSS is joined by SMHS to compete in the CWOSSA AA tournament at Holy Trinity C.H.S. on February 22/23. OSDSS advances to the CWOSSA AAA tournament at St. Mary’s High School (Kitchener) on February 22/23. Good luck to all BAA athletes and coaches. Junior: WDCS (“A” tournament winner), GHSS (“AA” tournament winner), were the two teams to advance in the BAA junior championship. Both teams were in third place after the end of the regular season. In a close final game, WDCS won 40 – 36. Both teams advance to their respective CWOSSA tournaments. 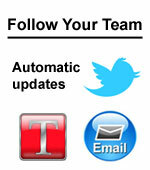 WDCS plays in the CWOSSA A tournament at Waterford District High School on February 21. GHSS is joined by SMHS to compete in the CWOSSA AA tournament at Holy Trinity C.H.S. on February 22/23. OSDSS advances to the CWOSSA AAA tournament at St. Mary’s High School (Kitchener) on February 22/23. Good luck to all BAA athletes and coaches. 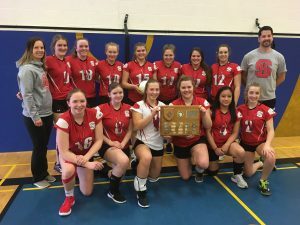 The 2018-19 BAA girls’ volleyball championship was held today at Walkerton District Community School. Senior: WDCS (“A” tournament winner), SHHS(“AA” tournament winner), and OSDSS (1st place in north division) were the three teams competing for the senior championship. SHHS defeated OSDSS in the championship game 3 – 0. In the semi-finals OSDSS defeated WDCS 3-1. All three teams advance to their respective CWOSSA tournaments. WDCS plays and hosts the CWOSSA A tournament on February 21. SHHS is joined by GHSS to compete in the CWOSSA AA tournament at Simcoe Composite on February 20/21. OSDSS advances to the CWOSSA AAA tournament at Waterloo University/Forest Heights on February 21. Good luck to all BAA athletes and coaches. Junior: GBCS (“A” tournament winner), SHHS(“AA” tournament winner), and OSDSS (1st place in north division) were the three teams competing for the junior championship. SHHS defeated OSDSS in the championship game 3 – 1. In the semi-finals OSDSS defeated GBCS 3-0. All three teams advance to their respective CWOSSA tournaments. GBCS plays and in the CWOSSA A tournament at Walkerton District on February 21. SHHS is joined by GHSS to compete in the CWOSSA AA tournament at Simcoe Composite on February 20/21. OSDSS advances to the CWOSSA AAA tournament at Waterloo University/Forest Heights on February 21. Good luck to all BAA athletes and coaches. 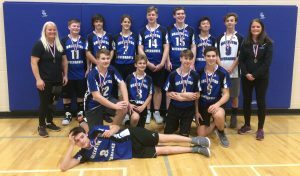 The Saugeen District Royals played their best volleyball of the season, and came away the 2018 AA CWOSSA junior boys volleyball champions. The Royals finished 2nd in Pool A on day one. This set up a semi-final against Bishop MacDonell on day two. 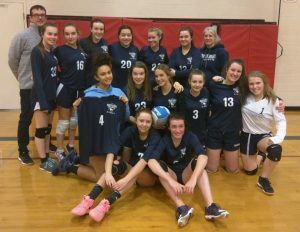 The semi-final went to the third set, with SDSS pulling out a 18-16 victory. 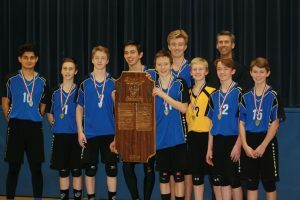 In the finals, Saugeen District faced Glenview Park, who beat them on the first day. Strong serving and smart attacking allowed the the Royals take the early momentum. 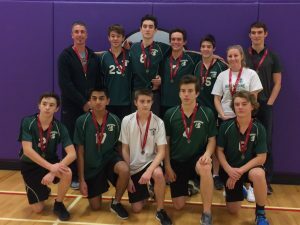 Keeping their foot on the gas, SDSS kept up the pressure and finished the championship in three straight sets. Last Friday, November 9th, Walkerton District hosted the 2018 BAA Girls’ Basketball championship. Both the junior and senior championship games had very exciting finishes. Senior: WDCS (“A” tournament winner), GHSS (“AA” tournament winner), and OSDSS (1st place in north division) were the three teams competing for the senior championship. 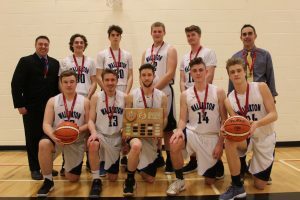 OSDSS defeated GHSS 47 – 26 in the semi-finals, and but were then defeated 45 – 42 by WDCS (who came back from 14 points down) in the championship game. All three teams advance to their respective CWOSSA tournaments. WDCS plays in the CWOSSA A tournament at Kincardine District on November 16. 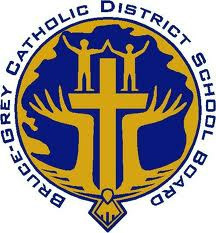 GHSS is joined by SMHS to compete in the CWOSSA AA tournament at St. Benedict (Cambridge)/St. David (Waterloo) on November 16/17. OSDSS advances to the CWOSSA AAA tournament at Resurrection/St. Mary’s (Kitchener) on November 16/17. Good luck to all BAA athletes and coaches. Junior: KDSS (“A” tournament winner), SMHS (“AA” tournament winner), and OSDSS (2nd place in north division) were the three teams competing for the junior championship. 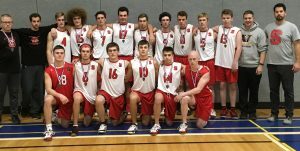 SMHS defeated OSDSS 36 – 26 in the semi-finals, but were then defeated 24 – 23 by KDSS in the championship game. All three teams advance to their respective CWOSSA tournaments. KDSS plays in the CWOSSA A tournament at Kincardine District on November 16. SMHS is joined by GHSS to compete in the CWOSSA AA tournament at St. Benedict (Cambridge)/St. David (Waterloo) on November 16/17. OSDSS advances to the CWOSSA AAA tournament at St. Mary’s (Kitchener) on November 16/17. Good luck to all BAA athletes and coaches. 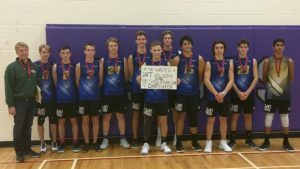 The 2018 BAA boys’ volleyball tournament took place today at OSDSS. 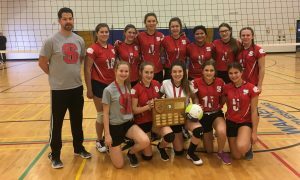 Volleyball was the first sport to complete the new CWOSSA and BAA playoff system. 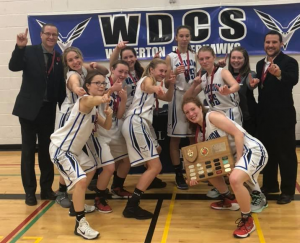 Senior: WDCS (“A” tournament winner), SDSS (“AA” tournament winner), and OSDSS (1st place in north division) were the three teams competing for the senior championship. SDSS defeated OSDSS 3-0 in the semi-finals, and then went to defeat WDCS 3 – 0 in the championship game. All three teams advance to their respective CWOSSA tournaments. WDCS plays in the CWOSSA A tournament at Woodland Christian on November 14. SDSS is joined by SHHS to compete in the CWOSSA AA tournament at Simcoe Composite on November 14/15. OSDSS advances to the CWOSSA AAA tournament at Waterloo University/Forest Heights on November 15. Good luck to all BAA athletes and coaches. 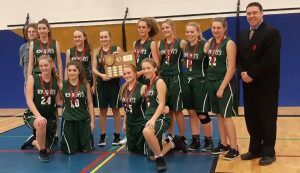 Junior: KDSS (“A” tournament winner), SDSS (“AA” tournament winner), and OSDSS (2nd place in north division) were the three teams competing for the junior championship. OSDSS defeated SDSS 3-2 in the semi-finals, but were then defeated 3 – 1 by KDSS in the championship game. All three teams advance to their respective CWOSSA tournaments. KDSS plays in the CWOSSA A tournament at Woodland Christian on November 14. SDSS will compete in the CWOSSA AA tournament at Simcoe Composite on Novemember 14/15. OSDSS advances to the CWOSSA AAA tournament at Waterloo University/Forest Heights on November 15.Good luck to all BAA athletes and coaches.